Good morning! No sleeping in for me today--none at all. 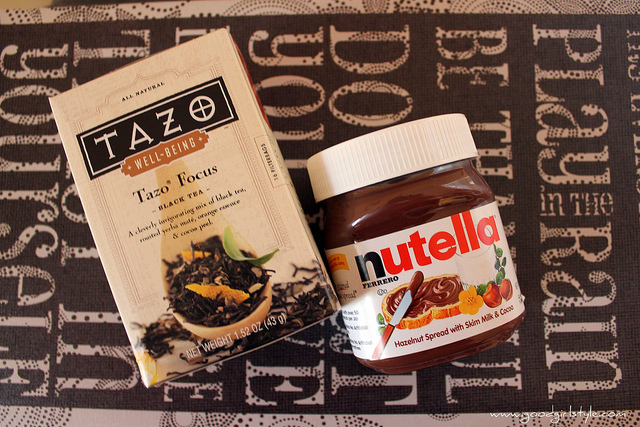 It's a sunshiney, wonderful morning, and I'm enjoying it to the fullest with some Tazo Focus tea (which, by the way, goes incredibly amazingly well with Nutella). This tea is my new "can't-get-enough" favorite (and it's on sale at Target!). My favorite moment is when she turns on the light to that perfect musical cue and it's suddenly night. Love it, girl! "I will think of you and wonder if you fell for me in Autumn." Reading God's word in the morning light is such a beautiful thing. I will praise God’s name in song and glorify Him with thanksgiving." Afflicted and in pain...but still praising. He is always worthy, despite our pain. No--not even 'despite' our pain. The word despite somehow takes away from the unconditional love, and the utter Goodness of our God, who lets nothing touch us without drawing us nearer His side (if we let it). He is worthy in light of our pain--He knows our pain. His mighty right hand is always there to uphold us.